Serves as many as you dare. By Dennis W. Viau; an original recipe from my college days. First off, let me state that I do not take myself too seriously. I’ve heard from many people who told me I shouldn’t refer to myself as a white trash cook. I’m a gourmet cook. Okay. But that doesn’t mean I don’t know how to put something nearly disgusting, but delicious, on the table. I really do enjoy this stuff, and I’ve eaten it many times. Start the rice cooking according to package directions—typically by combining the rice, water, bouillon, and butter in a saucepan with a cover. 1½ teaspoons of bouillon per 2 cups of water is usually enough. Stir the ingredients with a fork, bring to a boil, reduce the heat to low, cover, and let cook undisturbed for 15 to 17 minutes. If using Minute Rice, follow the package directions. Remove any bones from the leftover KFC chicken and coarsely chop it, skin and coating included. Place it in a skillet with the heavy cream and more bouillon, enough to flavor the cream without overdoing it. The coating on the chicken will add plenty of flavor; so go light on the bouillon. Add some cooked flour, about a teaspoon per cup of cream. Heat the chicken mixture until it starts to bubble and thicken. Remove from the heat and cover until needed. It can be reheated, if needed. When the rice is cooked, add a little butter and fluff the rice briefly with a fork. 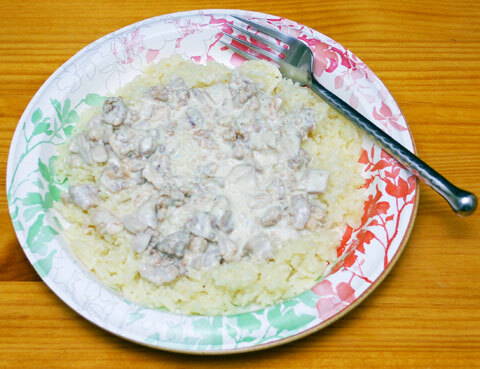 Spoon some of the rice onto a paper plate (no need to waste your good china) and top with chicken and gravy. Serve with plenty of cold beer on the side. Cooked Flour: I keep cooked flour in a jar in my cupboard, for when I need to thicken a sauce or gravy. Raw flour will impart a pasty, raw flavor. Heat some flour, maybe half a cup, in a skillet over medium heat until the flour begins to change color. Stir it often while it cooks and watch it closely. When the color starts to change to golden, immediately transfer the flour to a heat-proof bowl to cool. Do not leave it in the hot pan to cool because it will scorch on the bottom. When cool, store in a tightly sealed jar.